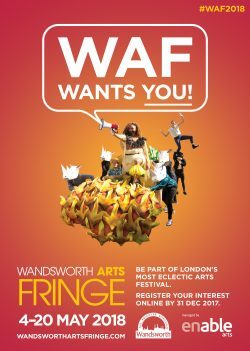 As it approaches its tenth year, Wandsworth Council’s Wandsworth Arts Fringe (WAF) has issued a call out to artists and venues alike to participate in London’s most eclectic arts festival. Concurrently, WAF is announcing a series of workshops and networking events for interested artists, potential venues and local businesses to find out more about what WAF has to offer. Since it began in 2009, WAF has gone from strength to strength, with 2017 being its biggest and most successful year yet. With 140 events stretched over 65 locations and involving 317 artists and 45 new products, WAF has seen a 30% increase in events and 38% increase in locations year on year. From street performances and family workshops, to exhibitions, music, dance and everything in between, WAF is a melting pot of creative activity and a platform for artist development. It also acts as a test bed for new ideas, a forum to meet likeminded peers and a showcase for both burgeoning talent and fully realised work. The 2018 Wandsworth Arts Fringe is set to grow even further. As part of the council’s commitment to support all participants in their WAF journey, there will be a series of networking events where artists, venues and businesses can meet and consider future collaboration in a relaxed atmosphere. Each event will be themed and interlaced with talks from guest speakers who will share their expertise in fundraising, marketing, social media and evaluation amongst many things. The first networking event will take place on Wednesday 11th October at St Mary’s Church in Putney, from 6pm. It will be preceded by an hour introduction for venues and local businesses about the benefits of offering up spaces to host WAF events in order to forge new links with local communities and to attract new audiences and customers. From existing theatres, galleries and concert venues to high street businesses, pubs, churches, sports halls and even station platforms, every conceivable space in Wandsworth in May is a hive a creative activity.